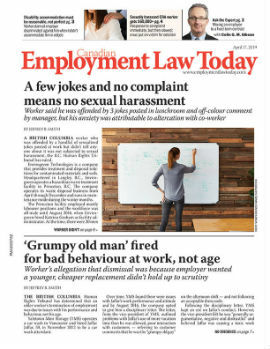 A British Columbia court has dismissed an employee’s constructive dismissal claim, finding the employee contributed to a negative work environment and ended the employment relationship herself. Barbara Danielisz, 42, was a customs broker employed with Hercules Forwarding, a shipping, storage and customs clearing company in Vancouver. She became manager of the customs department in 2003 and a director of the company in 2004. Tensions developed in the office between the customs department and the front office staff, and Danielisz and her direct reports sometimes criticized the front office staff in emails. Danielisz also often made derogatory comments about the front office and her staff complained about the negative environment in the office. Danielisz tried counselling her staff to get along “as best as possible” with the front office, making the point that business relationships could be separate from personal relationships. However, things soon became strained between Danielisz and one of her staff, and things deteriorated to the point where arguments and name-calling took place. The company held a meeting to attempt to resolve the situation, but Danielisz felt other employees ganged up on her. She also felt the company had exacerbated the situation by undermining her authority when her discipline for one of her employees was substituted for a lesser penalty. Soon, Danielisz went on stress leave in May 2005 and filed a workers’ compensation claim for stress and depression stemming from emotional abuse at work. She also filed a claim for constructive dismissal under the B.C. Employment Standards Act in July 2005. The company replied that it expected her to perform her duties and manage her employees. Danielisz’s workers’ compensation claim was rejected and she withdrew her constructive dismissal complaint. However, Hercules took her complaint as a repudiation of the employment contract and considered her employment at an end. Danielisz claimed she had always been willing to return to work and she was only off work because of her medical leave for stress. In May 2006, she filed a constructive dismissal claim in court. The court found that the conditions for constructive dismissal did not exist. Her authority was not undermined when a superior changed the discipline she had issued against a staff member because Danielisz was not primarily responsible for meting out discipline, said the court. There were also no other instances where it could be said her authority was undermined. The court also found that the company attempted to resolve some of the differences between employees in the office and the negative environment was not to the point where a reasonable person would find it too much to bear. In fact, the evidence showed Danielisz contributed as much to the negative environment as she suffered from it, and she had done little to make things better. Also, her stress may have exaggerated her perception of things, said the court. The court also agreed that Danielisz repudiated her employment contract by filing the constructive dismissal claim and Hercules was within its rights to accept that repudiation. Danielisz’s constructive dismissal suit was dismissed. Danielisz v. Hercules Forwarding Inc.
, 2012 CarswellBC 2321 (B.C. S.C.).